Seaweed appears in many spa treatments, including body wraps, hydrotherapy baths, and facials, because of its therapeutic properties: firming, toning, moisturizing, and hydration for the skin along with overall detoxification for the body. Seaweed is rich in nourishing minerals such as potassium, magnesium, calcium, phosphorous, and trace elements including copper, zinc, and iodine, which can be absorbed through the skin. It is a broad term for all the marine plants that live in the world’s waters, from microscopic algae to massive beds of kelp. Different types of seaweed have different properties. In spas, seaweed usually comes in the form of micronized algae, which delivers minerals in more concentrated forms. The benefits of seaweed are many: it revitalizes cells, which has a powerful anti-aging effect; it is anti-inflammatory, which is especially good for sensitive skin; and it helps hydrate and moisturize skin. But seaweed also stimulates the body's metabolism, which accelerates the body's own detoxification process. That's why it features in hydrotherapy baths, body wraps, and cellulite treatments. Some people dismiss the whole notion of treatments that support detoxification, but it can help stimulate the lymphatic system after a night with too much rich food and wine. You are likely to find many seaweed-based facials and body treatment at spas, particularly when they are located by the ocean. Every spa like a line that helps tell its story. For instance, OH! Spa at The Ocean House at Watch Hill in Rhode Island carries Phytomer and Osea, both made with marine ingredients. France is known for its "sea spas" which offer thalassotherapy, the therapeutic use of seawater. Located along the coast of Britanny and the French Riviera, thalassotherapy spas are part of the European tradition of going to spas to restore and maintain your health. With seawater-filled Olympic-sized pools and body wraps with real seaweed, The Sofitel Thalassa Quiberon in Brittany is the world’s largest thalassotherapy center. There really isn't anything like it in America. Here we bypass the seawater and get our seaweed in micronized algae form, applied to the body through various products. There is a long tradition of the sea being connected with good health, and modern research has confirmed much of what people knew intuitively. The plasma (clear part of our blood) has a concentration of salt and other ions that is similar to (diluted) seawater. It's like we are walking around with our own private ocean. Since marine plants obtain their nutrients from seawater, they are concentrated storehouses of all of the elements found in the sea. The thinking behind thalassotherapy and seaweed treatments is that because our human bodies are so physically similar to the ocean, they can "recognize" and take up more easily the beneficial minerals and trace elements in seawater and seaweed. During seaweed wraps and baths, minerals such as potassium, magnesium, selenium, iodine, and calcium along with trace elements pass through the skin, remineralizing our body and rebalancing our internal chemistry. Examples of seaweed spa treatments include seaweed baths, where micronized laminaria seaweed is added to water to tone the skin and replenish essential elements. In seaweed wraps, a warm, thick cream is applied to your body, usually after an exfoliating treatment like a body scrub or a body brushing. You are wrapped in plastic and a warm blanket or towel for about twenty minutes, after which you shower it all off in a stand-up shower or on a table with a Vichy shower. The benefits are numerous: the seaweed stimulates your metabolic system, remineralizes your body and soothes your skin. Seaweed wraps and bath treatments are also invaluable in providing detoxification. The magnesium and calcium levels of seaweed promote the elimination of trapped fluids and toxins that cause inflammation and contribute to cellulite. Seaweed treatments also improve the micro-capillary circulation to bring fresh nutrients and oxygen to the affected tissues. The result is healthier cells, and skin that is more toned and firm. One word of caution: ask the spa what product is used, then check on the ingredients online. For seaweed body wraps, a lot of spas use a ready-made product from Amber that uses seaweed extracts and French green clay along with synthetic ingredients, including PEG-100 Stearate, Dimethicone, and parabens. There are many high-quality marine-based body and skin care lines carried in spas. That's why it is found in many top-quality body and skin care lines, including THALGO, Phytomer, and Creme de La Mer from France; Osea and Spa Technologies in the U.S., Babor from Germany; and VOYA from Ireland. One way to experiment with the healing power of seaweed is to get facials and body treatments at spas that carry one of those lines. You can also just buy a product directly from the company and see how you like it. All of these lines have both skin care and body care products, but here are some suggestions about where to start. One of the leaders in the field, THALGO was founded in 1964 in France and has supplied micronized marine algae to French thalassotherapy centers since the early 1970s. Its Micronized Algae Powder was the product that helped with my miracle recovery, but you can buy it for home use. It has three types of algae to remineralize, stimulate circulation and drain lymphatic fluid. Founded in 1972, the French company Phytomer created a proprietary seawater concentrate called Oligomer, with an optimum dose of 104 trace elements and minerals to fortify the epidermis and prevent cellular fatigue. Oligomer is the basis for its skin and body products, but many of them, such as Oligomer Silhouette Contouring Enhancer Marine Bath, also have algae. Spa Technologies offers an excellent mineral-rich milky bath powder made with laminaria called Sea Cal that you can add to your bath. It is hydrating, remineralizes, and helps with drainage, making it good for use in conjunction with detox or slimming program. Follow up by applying Hydrating Laminaria Oil or Seaweed Firming Cream to extend the treatment. Osea, a California-based line, uses seaweed that is certified USDA organic and hand-harvested in Patagonia. It has an Undaria Body Soft Set that includes an exfoliant algae oil. In 2000 the Walton family opened VOYA Seaweed Baths in Strandhill, Ireland, bringing back the traditional bathhouses that had been wiped out in 1965 by changing consumer tastes and hurricanes. From the bathhouse came the development of organic seaweed-based bath, body, skin and hair care products. The first was the seaweed bath Lazy Days is still a good place to start. Creme de la Mer is a high-end French skincare line that turns fermented kelp into a proprietary "Miracle Broth" that thousands of users swear by. Babor, a German skincare company, has an extremely high-end collection of anti-aging face serums and creams called SeaCreation. The company has combined "the effective anti-aging protein Glycocéane GP3 with BABOR thermophilus and exclusive Green Caviar Algae Extract to form the Sea-telligent Complex". There are some 30,000 species of algae that are divided into families according to their colors: brown, green, red, blue-green, and white. Their different colors reflect the different type of light they will readily absorb for photosynthesis, which dictates how deep or how close to the surface they generally grow. Brown algae: The most re-mineralizing family of algae and traditionally used in slimming and rejuvenating programs. 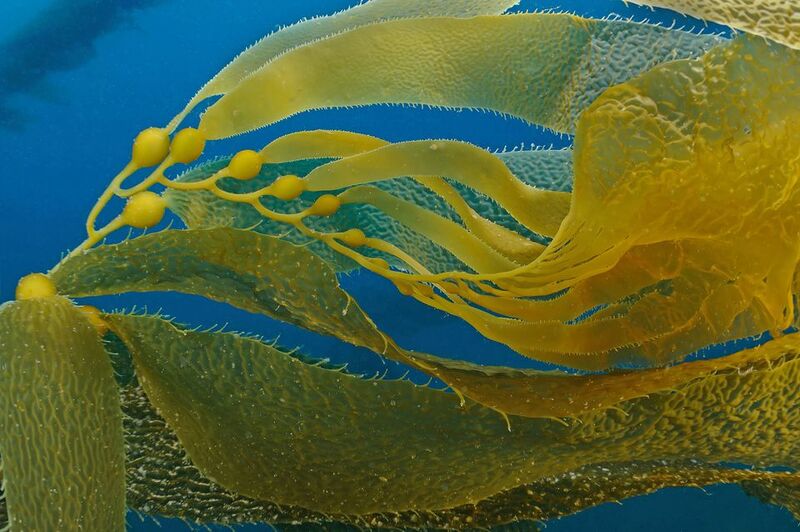 Laminaria algae are the richest in trace elements as well as beta-carotene, Vitamin K, and B vitamins. Additionally, 50 percent of its bulk is in the form of mucopolysaccharides such as alginic acid, fucoidan, laminarin, and mannitol—all of which have anti-inflammatory and healing properties. Red algae: Rich in amino acids, folic acid, and mucopolysaccharides to gently treat sensitive skin. Red algae are rich in essential fatty acids such as the omega-3 and omega-6 oils normally available from fish, as well as gamma-linoleic and arachidonic acids. Green algae: Its mineral content is weak compared to the brown and red algae and therefore is not commonly used in Thalasso treatments. Blue-green algae: Concentrated in amino acids, blue-green algae such as spirulina add an abundance of chlorophyll and trace elements to stimulate cellular metabolism. It is the natural way to provide brilliant color to seaweed bath products. White algae: A unique species in that these algae grow a natural calcium-magnesium shell. White algae such as Lithothamnium calcareum are soothing to irritated skin as well as help to drain excess bloat and water retention. Excellent in combination with the brown-green algae in the treatment of cellulite. Since not all seaweeds are alike, it's not enough that a skin care line puts "seaweed" on the label, or in the product. It has to be the right seaweed, in the right amounts, for the right purpose.